The fate of the mysterious big cat hangs in the balance as State Government researchers look into whether reported sightings are true, according to the Knox Leader. This follows numerous reports in the Leader of big cat sightings in both Upper Ferntree Gully and the hills and will fulfil a pre-election promise from Nationals' leader Peter Ryan, who said there were enough credible observations to warrant an investigation. Victorian Agriculture and Food Security Minister Peter Walsh said the big cat study would review literature, reports, correspondence and other evidence. Evelyn state Liberal MP Christine Fyffe said a big cat would be handled like any other wild animal. She said any non-native animal found attacking livestock would be killed. 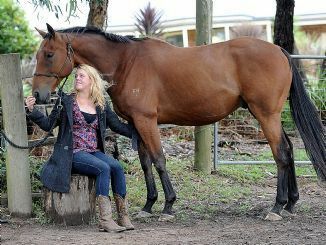 Kate Barry of Wantirna South stables her horse (pictured above) in The Basin and was horrified to see it had claw marks on its upper flank after being attacked last year. Yes they definitely do exist. I sighted one a few kilometres east of Spargo Creek near Ballarat in January 2004. It was a Black Panther and it leaped from one side of the gravel road to the other about six feet in front of my vehicle and it was huge. My godfather owned a pub in blackwood for several decades and he also sighted Black panthers and Mountain Lions (Cougars). The americans brought them out here in the 1940s and 50s with their Circus,s and a number of them either escaped or were set free for whatever reason. This mainly occured in Victoria, NSW and Queensland. Anyone who doubts their existence simply hasnt had the pleasure of sighting one. Hello I Am jasmine Palamara. In April their was a Belgrave teen that saw the Big Cat, i am that Belgrave teen, I know its real and i know it is out their and i am Very upset with the cancel of the investigation, i hope that this will be found because i know it is out their and i am very disappointed no one thinks it is!!! I have just read the official report about the state Government's "investigation" of sightings of wild big cats. As someone who has studied the phenomenon in detail, I agree in principle with the findings and recommendations of the report. However, this document tells only half the story, and I hope all the information is made public so that people can make an informed decision about what has been going on. I encountered a big cat about 15 years ago in the mountains east of Melbourne. It crossed the road ahead of my car and I had a good look at it. It was bigger than a dog, pitch black and had a very long tail and gait. I'm convinced they are there. Of course the alleged "big cats" don't exist! For that to occur, it would need a large - and obvious - sustainable breeding pool of - at the very least - dozens of animals. Consider all the other endangered species that are disappearing despite numbering sometimes in the hundreds as a comparison; Orang-utan; Proboscis Monkey; Snow Leopard; Blue Whale; Asian Elephant et al. To suggest that a mere handful of these imaginary felines could survive without such a pool is fanciful. I'm disgusted that our government would even contemplate spending hundreds of thousands of taxpayer dollars mounting such a worthless investigation regarding their (non) existence. And to claim a few scratches on her horse, as Ms Kate Barry does, as "evidence" of an attack by a big cat is totally unfounded. Has she never heard of roaming wild dog packs? If this is the sort of "credible" evidence that Peter Ryan supports his actions with, then I suggest that Mr Ryan stick to reading "Alice in Wonderland". It has more veracity than any big cat fairy tale. Forget big cats - search is on for tigers!